All of my students are physically disabled, and many are diagnosed with intellectual disabilities as well. 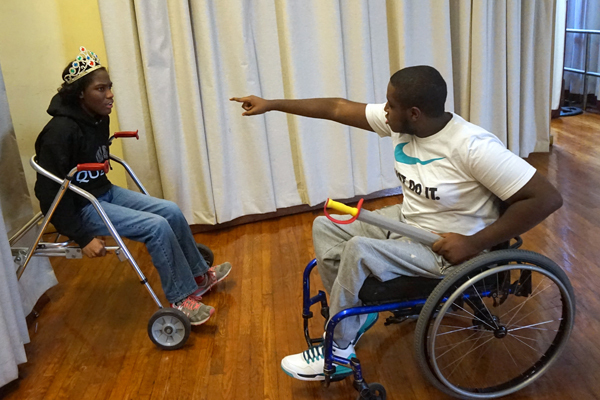 Able-bodied students can get up on their feet to perform. My students can’t get on their feet, but that doesn’t stop them from performing! Ergo – Hamlet on Wheels. This past summer, I had the amazing experience of cradling the Second Quarto of Hamlet (Q2) in my hands. This opportunity came through being selected to attend the Folger Shakespeare Library’s Summer Academy, an intensive week-long study of Hamlet. As I held this treasure, I was struck with a thought: the first 20 lines of the play were pretty easy to read. Yes, the S’s looked like F’s, the U’s like V’s, and there were some missing E’s, but despite the quirks of this 400-year-old version of English, I could read it with ease. Could my intellectually disabled students read these words? I thought, YES, they could. Then I displayed Hamlet 1.1—from the Second Quarto—on the board. I asked the students to take turns reading, line by line, and asked them what they noticed about the text. Within minutes they figured out the S/F U/V dilemma, and read beautifully. As a special education teacher, I look at literature differently; how can I make this work for my students? How can I adjust it to meet their needs, while helping them meet my uncompromisingly high academic expectations? A common strategy in special education is to modify. We modify lessons, texts, assignments, and assessments. But there is no modifying Shakespeare’s language. Ever. The language is the thing. The magic is in the words, in the language. The same language I had fallen in love with when I first met Romeo and Juliet in high school, was the very gift that I wanted to share with my own students. And, yes, I had to modify my teaching methods to show them how to analyze the language, how to delve into the characters, and how to roll away with a newfound love of literature. Please check back soon for the second part of Hamlet on Wheels, in which I’ll share more concrete, practical strategies for connecting special education students with Shakespeare’s language. Kathy Leonard has taught for over 14 years. She currently teaches physically disabled students in grades 9-12 at Widener Memorial School in Philadelphia. Her dream for her students has always been for them to access the same inspiration and education as their non-disabled peers. She is a NBCT special education teacher and an alum of the Folger Shakespeare Library Teaching Shakespeare Institute: Summer Academy 2015, which transformed her teaching methods and inspired her to get her students up on their wheels. Kathy, what an inspirational story…thanks for sharing it with us!